Sasha Darkovskaya, from Voronezh State Academy of Forestry Engineering, Voronezh, the Russia Federation, and Jon Burley, FASLA, from Michigan State University (MSU) were guests of the Landscape Architecture College at Nanjing Forestry University in 2007. 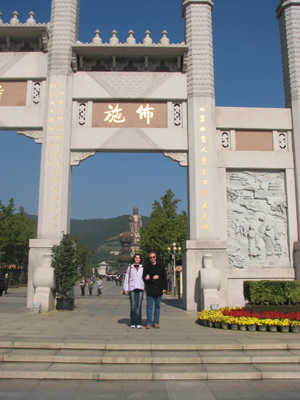 Burley and Darkovskaya at the Lingshan Buddha, near Tai Hu, Jiangsu Pronvince, P.R. of China. Image courtesy Jon Burley, copyright © 2007. All rights reserved. In a recent Russian publication, Burley and Darkovskaya described their impressions of the state of Chinese landscape architecture (Burley, J.B. and Darkovskaya, A.S. 2009). One of the most notable differences between professional practice in Europe and the Americas in comparison with China is that professors at universities in China are very heavily engaged in professional practice. Many of the most important planning and design projects in the country are often designed by professors at major universities. Professors are seen as an important expert resource for major projects. In addition, professors, even within the same university, develop highly competitive teams of students as though they were a small independent office. In addition, there is a big difference between the West and China regarding the emphasis in higher education. In the West, graduate degrees typically include scholarship and especially for the PhD, a major research component. While Chinese scholars do engage in research, many landscape architectural graduate students write papers on design projects and the historical aspects of design. For a Chinese landscape architectural scholar, an indication of success and merit is to be published in either Landscape Research, Landscape and Urban Planning, or Landscape Journal, which are all major Western landscape architectural research journals. At the same time, Chinese landscape architectural educators are pursuing improvements in the quality and level of research activities in the nation. There is relatively little consistency among landscape architecture programs across China. For example, some emphasize horticulture while others emphasize site design and site planning. Landscape planning is emerging as a topic in the more comprehensive programs (Burley 2008, Lewis and Clark in Perspective). However, the Chinese are exploring approaches to develop more uniformity for landscape architectural education in China. In the West, landscape architectural design addresses the needs of the client, environment, and site users. In contrast, Chinese designers focus primarily upon the needs of the client with an emphasis upon aesthetic beauty for opening day. In Chinese culture, the perception of success and great beauty for opening day is extremely important. While there are differences between the West and China, there are also many similarities. Wang and Burley (2009) addressed the differences and similarities in a paper at the American/Canadian International Peace Gardens (North Dakota/Manitoba) and the Chinese Dalian World Peace Park (China). There are many talented designers in China, and landscape architecture is a very busy and thriving profession there. China has many ethnic minorities and religious values. Among other things, these professionals work to preserve ethnic villages, religious sites, landscapes with great natural beauty, and historically significant places. 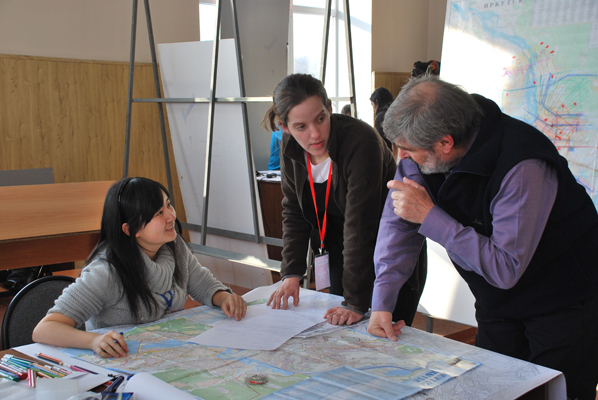 During the winter of 2009, Mo Fei and Tang Min participated in an international urban planning workshop sponsored by the Baikal University, Irkutsk, Russian Federation. Mo Fei (sitting) discussing design issues with a student from France and a French professor. Image courtesy MoFei, copyright © 2009. All rights reserved. Mo Fei is a landscape architecture student from Tongji University in Shanghai. She began pursuing her PhD in Sheffield, United Kingdom in 2010. Tang Min is an art student also from Tongji University. This was the 10th workshop sponsored by the university, and focuses on the development of young specialists and representatives of various countries and cultures. The theme of the 2009 workshop was “Streetscapes,” and focused on the following issues: Urban planning analysis of established streetscapes in the central part of Irkutsk: street, boulevard, square, embankment, interquarter traffic driveway and parking; the elaboration of a concept for transport and the street-road network of Irkutsk; and the elaboration of a concept for the street-road network reconstruction of the city’s centre. The workshop had over 30 participants from 9 countries (Russia, France, China, Korea, Lebanon, Italy, Germany, Canada, Mongolia). Participants were selected based on reports submitted by the students from their home university. Naturally at times, communications and cooperative activities proved difficult because many participants could not speak a common language fluently. Still, through dedication and creativity via the language of design, communication barriers were overcome. During the workshop, the students worked in teams, each of which made three presentations on a design concept and progress. The jury was composed of experts from all over the world, a local government’s representative, and university professors. Participants also enjoyed leisure activities in the dormitory and the city that facilitated team building and friendship. After the final presentation, participants had a wonderful weekend at the lakeside of Lake Baikal. Mo Fei and Tang Min found the Russians to be great hosts. 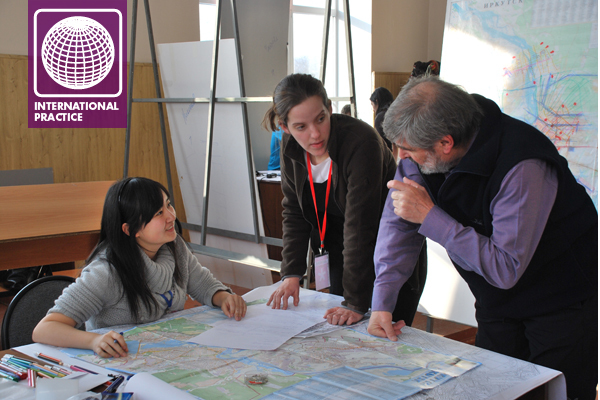 Wei Songlin teaches landscape architecture in the south of China and was a visiting professor at MSU in 2008 and 2009. He made a number of observations about how landscape architecture is taught differently in the U.S. and in China. He noted that rooms/studios at MSU are flexible, flowing, interactive, noisy, and quite busy both day and night. This was quite different than in China where students learn in traditional classrooms but work on their projects at home. In addition, American student have twice or three times the amount of reading material per course compared to Chinese students who read most of their material outside of the classroom. At MSU, many teachers place support materials on-line, including the course syllabus, power point lectures, and assignments. He was surprised by this and the fact that the typical class day was from 8am to 6pm, usually with no break at noon. He also found it interesting that students were encouraged to ask any questions by raising a hand, even if it meant that the class might be interrupted many times. While student could eat, ask questions, or leave classroom as needed, students did not chat with each other during lectures but paid attention to the speaker. In China, by contrast, a project, student practice, and personal experience are far more important feature of instruction than the content of a lecture in class. The teachers’ goal is to train students in design thinking and operating capability. During lectures, the instructor may talk about scientific research, cutting edge theories, techniques, and ideas, as well as academic achievement, and professional practice. They can exercise great flexibility in their lectures. Teachers often assign students real sites on which to practice their design capability. Students spend a great deal of time working on inventory, discussion, presentation, model-making, cartography, and construction detailing both in teams and individually. Students can visit some famous and important companies and even study in the West for three month-periods. 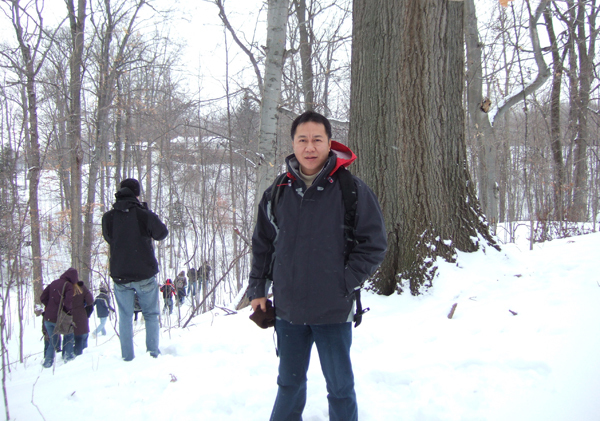 Wei Songlin on a fieldtrip in Michigan with students to a site for a future design project. Image courtesy Jon Burley, copyright © 2008. All rights reserved. Also in China, all faculty members of a university department work in a single building, with one office per professor. There are often two or more faculty and committee meetings a week, lasting 2 hours or 4 hours per session. Teachers may use up to half of their work time to conduct research outside the class. This is very different than typical faculty activities in the West. The famous cultural anthropologist Lewis Binford notes that often the written word gives more insight into the writer than the person or culture they are describing. This is true here, too. Each author was free to contribute whichever perspective they wished to convey. While Chinese culture is thousands of years old and is heavily based in the arts and sciences, the American and Russian considered Chinese landscape architecture as formative and emerging. This was true despite the fact that Chinese planning and design principles found in Feng Shui are much more ancient. The two Chinese students, who are culturally guided in the ways of harmony and cooperative activities, describe the Russian experience on friendly terms, despite experiencing some difficulties and hardships. In contrast, the Chinese professor was intrigued by the fluidity and flexibility allowed in the American education system—something that was unique for him. These perceptions illustrate how individuals from three cultures that each work in planning and design interpret, internalize, and express their work differently. And obviously, there are many more cultures with unique insights and perspectives. This era of cultural exchange and experience presents numerous opportunities to listen, observe and learn. Sharing the experiences and ideas can assist future generations in their quest to plan, design, manage, and preserve the environment. Burley, J.B. 2008. Landscape planning: an American landscape architectural perspective. Landscape Architecture China 23(02):82-86. Burley, J.B. 2008. Lewis and Clark in perspective: developing an international view concerning history in recreation, historic sites, and tourism. International Practice Professional Practice Network March 2008 Newsletter. American Society of Landscape Architects, Washington DC: 6-8. Burley, J.B. and Darkovskaya, A.S. 2009. Landscape architecture—east and west; a historical and educational comparison. Kruglyak, V.V. (ed.) in: Landscape Gardening Architecture: Modern Problems: Materials of International Theoretical and Practical Conference. Federal agency of education, VSAFE, September 3-4, 2009,Voronezh, Russia: 13-17. Wang, Y. and J.B. Burley. 2009. Peace parks a global perspective. WSEAS Transactions on Environment and Development, 5(1):65-75. Jon Bryan Burley, FASLA, is an associate professor at Michigan State University. Sasha Darkovskaya, Voronezh State Academy of Forestry Engineering, Voronezh, Russia Federation, currently works as the department head of a visa/passport office. Songlin Wei is in the faculty at the Zhongkai University of Agriculture and Engineering, Guangzhou P.R. of China. Mo Fei is a PhD Student in landscape architecture at the University of Sheffield. Tang Min is currently an architecture graduate student in Paris, France.